If you want to improve the world,Â eliminate filler words such as “you know” and “like.”Â That’s what Pulitzer Prize winning historian David McCullough told the graduates of Boston College Monday during the school’s commencement ceremony. “Please, please do what you can to cure the verbal virus that seems increasingly rampant among your generation,” McCullough said. McCullough said heâ€™s particularly troubled by the “relentless, wearisome use of words” such as like, awesome and actually. “Just imagine if in his inaugural address John F. Kennedy had said, â€™Ask not what your country can, you know, do for you, but what you can, like, do for your country actually,” he said. Out of curiousity, I typed “Like” and “you know” into the search engine for YouTube and found a clip from poet and performance artist Taylor Mali. I think the standard for a great meeting or a terrific conference has changed. In other words, “I flew all the way here forÂ this?”Â is going to be far more common than it used to be. If you think a great conference is one where the presenters read a script while showing the audience bullet points, you’re wrong. Or if you leave little time for attendees to engage with others, or worse, if you don’t provide the levers to make itÂ more likelyÂ that others will engage with each other, you’re wrong as well. Here’s what someone expects if they come to see you on an in-person sales call: that you’ll be prepared, focused, enthusiastic and willing to engage honestly about the next steps. If you can’t do that, don’t have the meeting. Here’s what a speaker owes an audience that travels to engage in person: more than they could get by just reading the transcript. There are at least two things conference attendees can’t get from a transcript. The first is relationships with the speaker and the other attendees. Â The second is a chance to get their personal questions answered. Â If you aren’t ensuring that your presentations do both, then your presentations could be falling short. Sellers constantly ask me how to deliver sales presentations that separate them from the competition. Sometimes that separation can be accomplished with something as simple as fewer slides. Working with a software team last week, an account representative told me that he was pitching for a piece of business against several other highly qualified vendors. Â “I never bring more than five slides,” he told me. He won the business. And while there were many reasons for the win, he separated himself from the competition by refusing the temptation to overwhelm the prospect with too many slides. Sellers often try to separate themselves from the competition with increasingly complex attempts to distinguish their products and services. That often means more slides. Â But often we can separate ourselves by just executing the presentation in a way that makes life easier on the prospect. User-friendly presentations send a wonderful message about what it’s going to be like to do business with you.Â That separates you. In other words, they think it makes our greatest Civil Rights leader resemble Saddam Hussein. The proposed statue is particularly ironic in light of Dr. King’s famous ability to connect with audiences. Â He was certainly one of our nation’s greatest and most moving speakers. Â Yet in the proposed statue, he is standing in a classic closed position. If we saw one of our clients standing like that in a workshop, we would urge them to open up and connect. In fact, we’d urge them to assume a position more like the stance portrayed in the memorial statue of Dr. King displayed at the University of Texas at Austin as seen below. There Dr. King is shown in a more open stance, reaching out and connecting with an audience. I’m no art critic. And I’m certainly no political scientist. 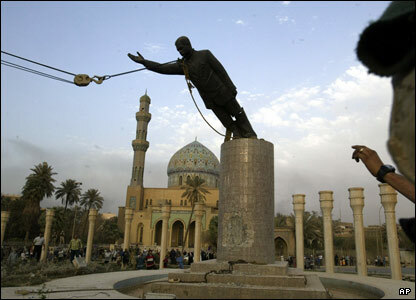 Â But it does look like Saddam, when he commissioned his statue, was trying to make himself look like the kind of leader that reaches out and connects with audiences.